Tim Smith was a full back with a sound defence who loved to attack from deep in his own half and a talented if inconsistent goal kicker. 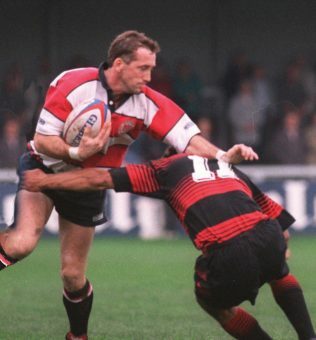 He made 347 appearances for Gloucester between 1982 and 1996 scoring 2681 points, including 90 tries. Tim saw the start of the league system and played 94 league games, scoring 588 points. He played against Bath at Twickenham in the 1990 Pilkington Cup Final, but missed out on representative honours at a time when the three best full backs in England all played in the South West, although he did play in an England Under-23 trial in 1985. Tim Smith was born in Gloucester in May 1962 and educated at Saintbridge School. Before coming to Kingsholm, he represented Gloucestershire Colts and played junior club rugby for Widden Old Boys, Brockworth and Gordon League. Tim made his 1st XV debut in March 1983, scoring all five penalties in a 15-3 victory over Abertillery. He played in nine of the ten remaining games that season and was fully established at full-back the following year. He remained a Gloucester 1st team regular at full back or wing for the next 13 seasons. Solid under the high ball and with genuine pace coming into the line, he would also sell the occasional outrageous dummy to the delight of his supporters in the Shed. Perhaps his first big challenge came on 23rd March 1985 at Kingsholm in a cup semi-final against Bath. On a heavy rain-soaked surface with kicking a lottery, he scored all his side’s points (2 tries and a penalty) in a 12-11 defeat. The Times reported that “he looks a fullback with a future” and that in addition to scoring the two tries, he “took everything that Bath could throw at him”. 1984-85 was an outstanding season for Tim, in which he scored 12 tries and kicked 284 points. He played in an England Under-23 trial at Walsall in April. After another successful season in 1985-86, a loss of form and strong competition from Nick Marment meant that he played only 15 1st XV games the following year and spent a prolonged spell in the United XV. 1986-87 was, however, Gloucester United’s most successful season in their history, as they finished with a record of Played 35 Won 33 Drew 2 Lost 0. After a further season of sharing the fullback duties with Nick Marment and Paul Mansell, he came back strongly in 1988-89 to score 11 tries and kick 302 points in perhaps the best season of his career. The 1989-90 season, although ending in the disappointment of a 48-6 Pilkington Cup Final defeat at the hands of Bath, was nonetheless a great one for the Gloucester club. Aiming for the Courage League/Pilkington Cup double, the club finished runners-up in both competitions. Tim Smith played in 8 of the 11 League games and in every round of the Cup. In all matches he scored 10 tries and kicked 229 points. Tim Smith shared the full back spot with Martin Roberts in 1992-93. Martin was kicking well and when they both played, Martin would retain the kicking duties and his place at full back, while Tim moved out on to the wing. Tim was joint top try scorer that season with 9 tries, including a hat-trick while playing on the right wing against Newport at Kingsholm. He moved back to full back the following season, but with the arrival of Mark Mapletoft, went back to the wing, scoring 8 tries in 20 games in 1994-95. Tim finished his Gloucester career with a triumphant farewell at Twickenham on 20 April 1996, playing full back for Gloucestershire in the County Championship Final. Gloucestershire beat Warwickshire 17-13 to equal Lancashire’s record of 16 titles, in the last season of the competition in its traditional format. He had said his farewell to Kingsholm ten days before while kicking three penalties and a conversion in a pulsating 16-10 victory over Bath, which went a long way towards saving Gloucester from relegation. At the age of 34 and with the onset of professionalism he joined the ambitious Worcester club, making 54 appearances and scoring 353 points in three seasons 1996-1999 during which they progressed from Courage League National Division 4 (North) to Allied Dunbar Division 2.